2016 has been a big year for events in the sky. There was a total solar eclipse in March that lit up Saturn, Mars and Antares. 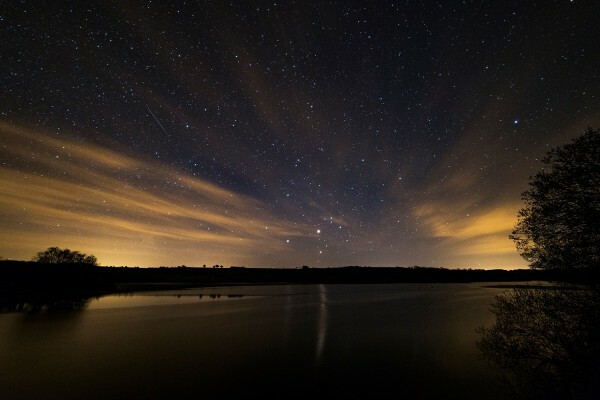 In May, Mars was at its biggest and brightest, debris rained down from Halley’s Comet and became the Eta Aquarids meteor shower, and we got a great view of Mercury. But the year definitely isn’t over yet, and there are still three great astronomy events to come. Read below and mark your calendars! As soon as the sun goes down on both August 23 and 24, the two brightest planets that are visible to the naked eye will line up: Mars and Saturn. They’ll also line up with Antares, the main star in the constellation Scorpius. Likely the most stunning part of this event will be the clash of orange and red between Mars and Antares. Along with Saturn, they will form a vertical line that will be low in the southwest evening sky that you’ll definitely be able to see with a set of binoculars. After the sun and the moon, the two brightest objects in our night sky are Venus and Jupiter, and next month, they’re set to have a very close encounter. At dusk on August 27, quite low in the western sky, the two neighbouring planets will come face to face, but will appear to be separated by just 10 arc-minutes, which is about a third of the diameter of the moon’s disk. Because this conjunction is going to be so low on the horizon, the glare of twilight might make this a little more difficult to see. If you have binoculars, it will definitely make this planetary meeting easier to spot. Although Mars’ brightest moment has already passed, when it meets Lagoon, the most well-known cloud of interstellar gas and dust, it will be almost as breathtaking. As soon as it gets dark on September 28, Mars will get really close to Lagoon Nebula, highlighting it for us from 4,000 light years away. The planet will be less than 1 degree away from Lagoon, which means you’ll be able to see them at the same time in the same field of view with binoculars or a telescope.